Yummy Baked Pumpkin French Toast Recipe! I know everyone loves pumpkin themed recipes during the fall and winter but I like them any time of the year. If you love French Toast and Pumpkin recipes then you are going to fall head over heels for this Baked Pumpkin French Toast recipe! I love that we can use almond milk in this recipe as I love almond milk. I use almond milk in coffee and so many recipes, it’s a fabulous substitute for milk especially for people like me who don’t love milk. 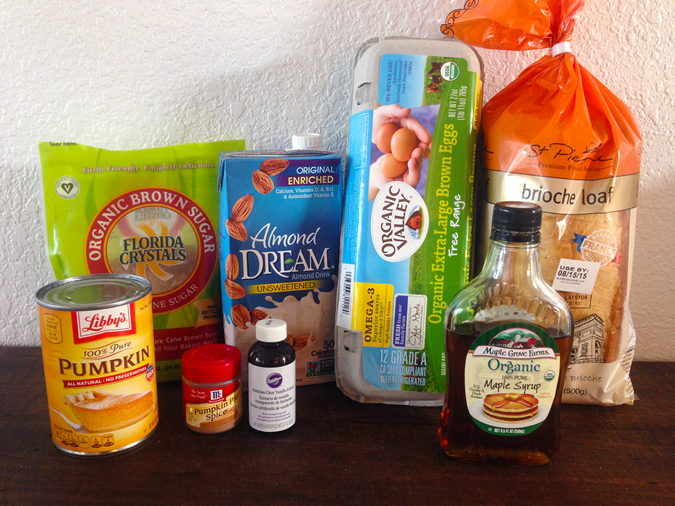 In medium mixing bowl, whisk together Eggs, Vanilla Extract, Pumpkin Spice, Almond Milk, and Maple Syrup. Using 6 ramekins, (which are individual servings), tear a part 1½ pieces of Brioche Bread for each ramekin. 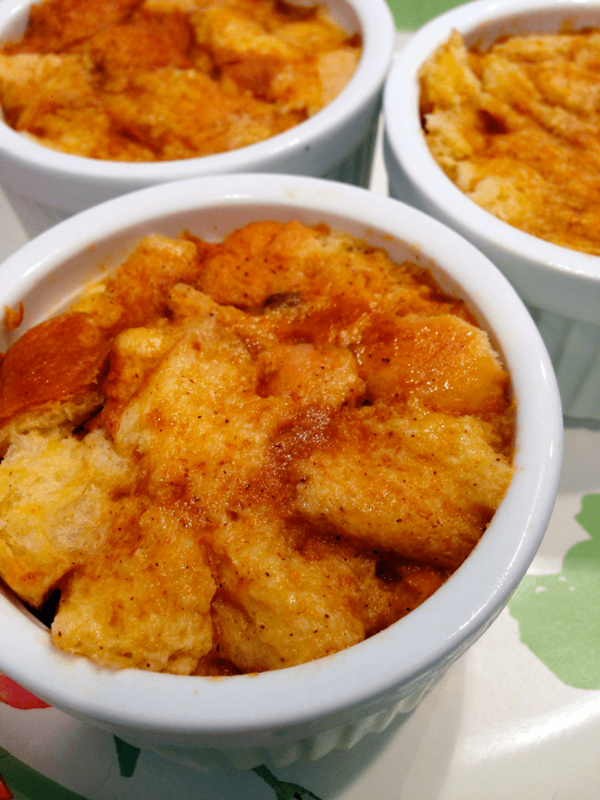 Fill halfway full of bread and pour egg mixture atop, distributing evening to each ramekin. Use a spoon to pat down the bread so that it soaks up the egg mixture. Fill the remainder of each ramekin with bread. Pour the remainder of egg mixture into each ramekin. Pat down the bread once again. Place ramekins onto baking sheet. Cover with Saran Wrap. Keep in refrigerator for 12 hours. Preheat oven to 350 degrees F. Remove ramekins from refrigerator. Remove Saran Wrap and bake in oven (on baking sheet) for approximately 30 minutes or until golden. Remove. Each dish will rise quite a lot, but will settle within a few minutes after removing from oven. Sprinkle brown sugar atop each serving, and add maple syrup if you so desire. Now that leaves are starting to turn color I think that this delicious Baked Pumpkin French Toast is even more appealing. I don’t know what it is about Fall and Winter that has us craving pumpkin anything but I do know that French Toast is always popular in my home. I think this is perfect any time but how special would it be for oh say the morning of Thanksgiving or Christmas morning. You just have to plan ahead but hey that’s all good right because at least the next morning you just pop these in the oven and the scent starts to fill the house. Then basically you’re taking them out to eat, easy peasy for what will already be a busy morning. Now just fair warning these smell so darn delicious that you may have the neighbors wandering over wondering what smells so good. After the first time your family has this yummy recipe they may be begging you make it over and over again as they’ll never get sick of it! Now go and enjoy and let us know how you liked it. What is your favorite French Toast recipe? Feel free to share we always love more yummy ideas! These look so delicious and would be great for desert! Yummy! I have never had baked french toast. I haven’t had french toast in quite a while, period. Sound good. Oh this sounds just amazing!! Im a pumpkin freak!! Ive pinned this to try this weekend!! I love French toast & pumpkin! This is a dream recipe for me! This is a good recipe. It’s worth planning ahead a bit to have a good meal in the morning. This will be on cool winter morning. I love french toast. I am going to try this, thanks! Holy Moses I need this in my life! Thank you for sharing this! I pinned this one to pinterest so I could use it later, my printer is out of ink and it will probably be a couple of weeks till I can get any. Never thought to bake french toast? !It is a great idea.Thank you! This looks like a fine and outstanding fall breakfast treat. I have to wonder which syrup would taste best on it. This sounds absolutely fantastic and looks just as good! Thanks for the great recipe!!! looks soooooo good! what a special autumn breatkfast treat! OMG!!!!! I LOVE FRENCH TOAST AND PUMPKIN. THEY REALLY SOUND DELISHOUS TOGETHER. I’M EXCITED TO TRY IT. I’M GONNA HAVE TO EMAIL THIS TO MYSELF. I love French Toast, but I’m not a pumpkin fan. This time of year is not great for recipe lovers who hate pumpkin, lol! This looks so delicious.I would love to make this for a dessert or breakfast. Reading this makes me hungry!! Yummy!! This sounds really good, French Toast is one of my favorite things to make for breakfast, and adding pumpkin to it is genius! I love anything with pumpkin in it & this looks & sounds like a delicious recipe. Never had pumpkin French Toast before. Going to go pin this recipe right now! I haven’t had french toast in a long time. This looks very good. I love french toast and this has a Fall flavor to it!! Going to have my aunt make this as she’s the cook around here. Thanks for posting. I would love to modify the recipe! these look so special!! I’d love to make these for regular and for company! (Baked Pumpkin French Toast Recipe) Now this sounds like something new that my husband and I would enjoy making for breakfast some weekend. Looks delicious! Pumpkin is my favorite fall flavor. Yum! Yum! I’m going to try this recipe using coconut milk. We have a favorite coconut pumpkin pie we like to make during the holidays. This will be a close second! We have been painting all day. I good could use these. YUMMY. I love both french toast and pumpkin. Thank you for sharing this recipe with us. It sounds and looks amazing. I have a serious case of pumpkin burnout right now. I’m going to pin it and try it in a few months. Thanks! This is a new way to use pumpkin! My guys would love it! We love everything with pumpkin in it so this looks perfect to make for my family they would just love having it ! I’m loving seeing all these pumpkin recipes! This looks and sounds so good. Will pin this so I can try this! I like pumpkin desserts and I like french toast, I am looking forward to giving this baked pumpkin french toast a try. Thank you for sharing this recipe.